A LOCAL councillor has accused NI Water of a “cop out” over the replacement of 22 stolen manhole covers at the Sally Gardens Community Centre. The covers, which were stolen from the Community Centre’s grounds last month, have yet to be replaced and Cllr Stephen Magennis said the centre cannot afford to replace them out of its annual funding. “NI Water have informed us that they are not responsible for replacing these covers and that the money should come out of our funding at Sally Gardens. We’ve been told it’s Sally Gardens’ land and it’s up to us to replace these covers,” he said. Sinn Féin MLA Jennifer McCann told the Andersonstown News she has been in contact with the Department for Regional Development Minister and NI Water over the issue. “In the first instance, I want to condemn the recklessness of those responsible for stealing these manhole covers in the first place and the way they have put children’s lives at risk. 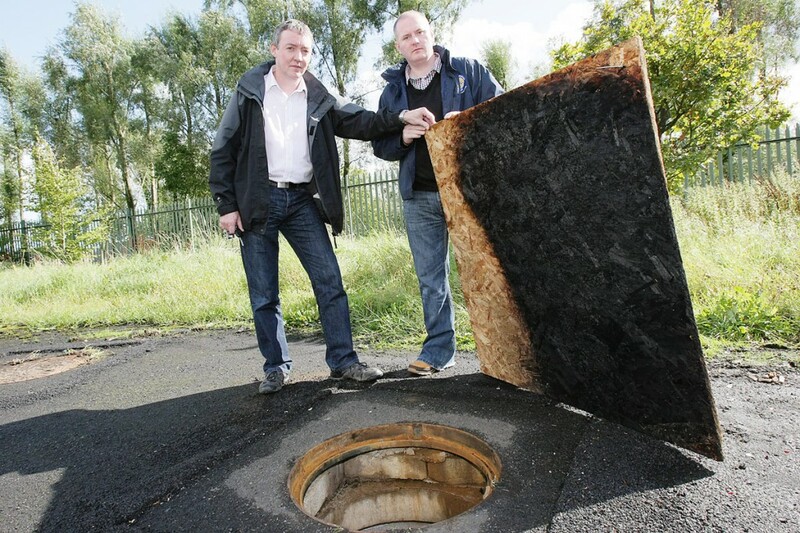 A spokesperson for NI Water said: “On initially being informed of the theft of the manhole covers, NI Water, in the immediate interest of health and safety, put in place temporary covers. NI Water met with representatives from the community centre to explain this and while we sympathise with the community group the issue of ownership is clear and it remains the responsibility of the property owner to replace the missing covers. “NI Water would like to highlight the dangers of playing down or near sewers. The depth of some sewers can be several metres and if someone were to fall in and become injured, they may not be able to pull themselves back out. “There is also the danger of fast-flowing sewage or stormwater making its way through the pipe,” added the spokesperson.